The República Dominicana occupies the eastern two-thirds of the island of Hispaniola, one of the places that Christopher Columbus visited on his first voyage in 1492. The region has been claimed alternately by Spain, France and Haiti (the latter controlled the entire island from 1822 to 1844 – Haitians say 1874), and was twice occupied by the United States. Today the Dominican Republic is a sovereign nation with the largest economy in the Caribbean. It is second-largest in land area and population, after Cuba. Its capital, Santo Domingo, is considered the oldest city in the Americas and was declared a World Heritage Site by UNESCO in 1990. The first railways were private lines on the sugar plantations that developed after 1870, primarily on the south coast between Santo Domingo and La Romana [see map]. The country has a mountainous terrain and never developed an extensive railroad network. 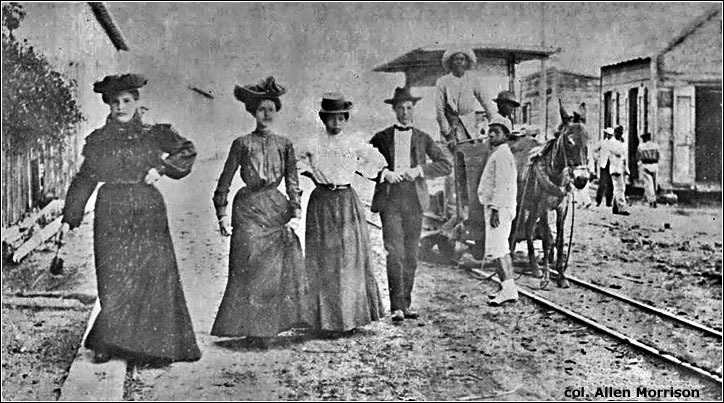 The Samaná & Santiago Railway inaugurated its first section on the north coast in 1887 and the Ferrocarril Central opened a line with a cog segment south from Puerto Plata in 1891. Despite many plans and efforts, there was never a rail connection between these lines in the north and the capital in the south. All railroads have disappeared today. The Dominican Republic's street railways are difficult to research. Only two are known (with certainty), both animal-powered, and although they played unique and important roles in the development of two cities, neither the government nor historians paid them much attention. Both disappeared early in the 20th century, so there are not many photographs or picture postcards that show them. Nobody that rode them could still be alive. 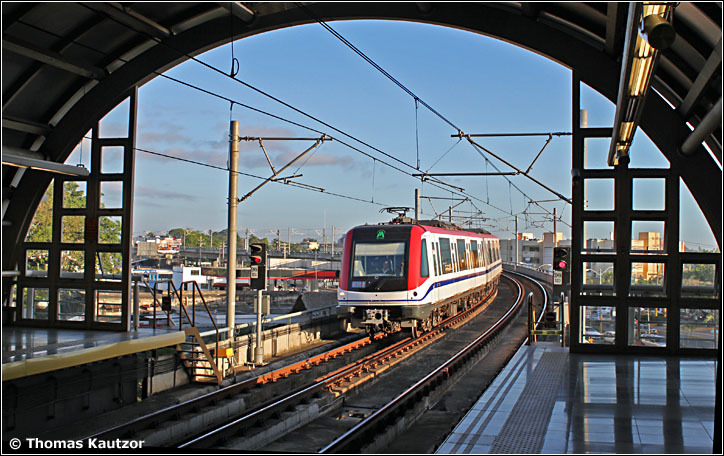 According to the government's Colección de Leyes, Decretos y Resoluciones, the first franchise for the construction of an urban railway in the Dominican Republic was awarded on 18 July 1882 to a French engineer named Henri Thomasset. The Frenchman proposed, simply, "a tramway system to connect the port and streets of Santo Domingo with its environs". He registered Sociedad Anónima Tranvías de Santo Domingo and renewed his petition several times in the following months, arguing that he would not begin construction until his vehicles arrived from Paris. The government annulled his contract on 25 June 1883. 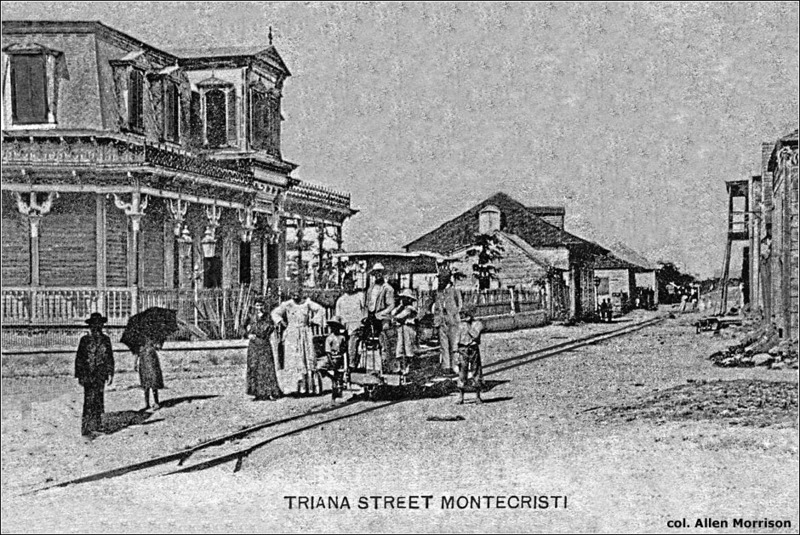 Thomasset was successful in other projects on the island, but not street railways. One wonders if his trams ever arrived, and, if so, where they ran. 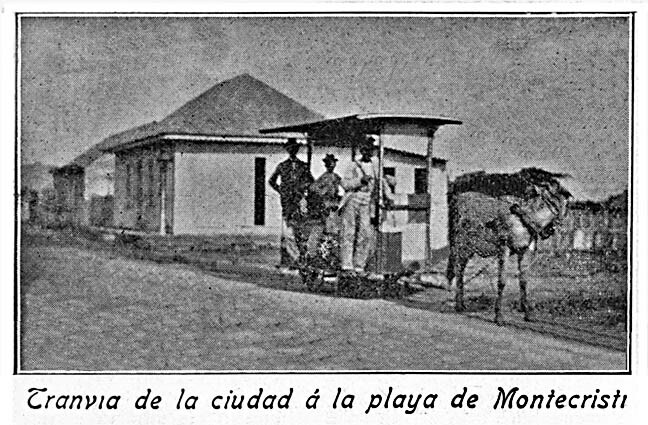 On 2 January 1884 C. M. Mayans y Compañía secured another contract to build a tramway in Santo Domingo, this time with more specifics: a horsedrawn line of 30 inch/762 mm track gauge from a dock on Río Ozama over Calle del Comercio (today called Calle Isabel la Católica) and Calle de la Separación (Calle El Conde) to the tram depot in San Carlos (a spot north of today's Parque Independencia) [see map]. From that point steam locomotives would pull the cars to sugar plantations beyond. The fincas de caña already used 30 inch/762 mm track gauge. 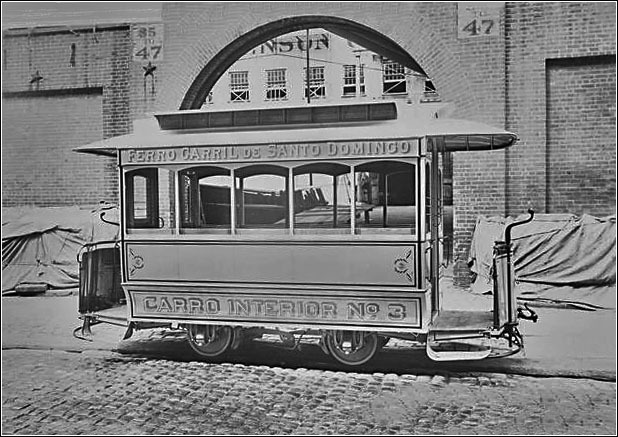 The Ferro-Carril de Santo Domingo continued to carry passengers for 19 years. At some point the line was altered at the east end and extended west down Avenida Independencia to Playa de Güibia in the district called San Gerónimo [see map]. It helped the city expand beyond the original "Zona Colonial". 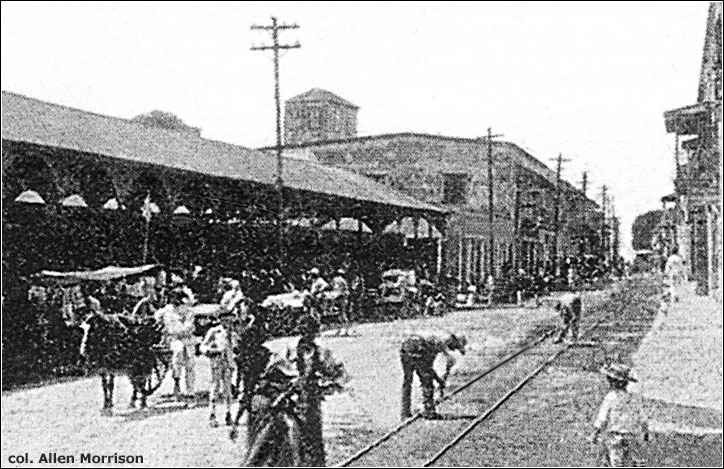 However, during a visit by the U.S. Marines in March 1903 protestors attacked the tram depot and destroyed all the cars. So ended tramway operation in the Dominican capital. The Dominican Republic's only other (known) street railway was in this small town in its northwest corner, about 25 km from the Haitian border [see map]. Its origin is mysterious. Local histories barely mention it and multi-volume descriptions of the Dominican Republic ignore it completely. 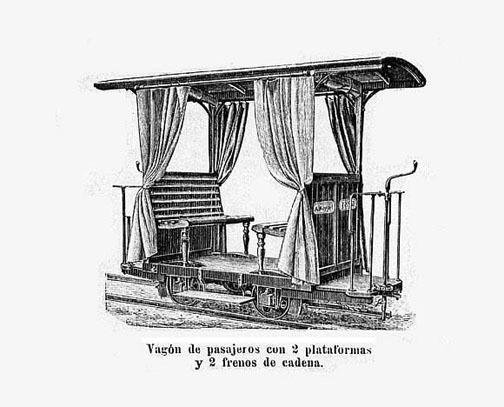 The most likely explanation of its origin is franchise 1342 awarded on 10 November 1874 to residents Antonio Espín and Thomas Todd, who wanted to import locomotoras to bring passengers and produce from the agricultural region south of the city. Espín and Todd did not want a railroad, only special "road locomotives" which, they explained, marchen sin necesidad de rieles – run without need of rails. Anxious to promote commerce and develop its ports, the government gave immediate approval. 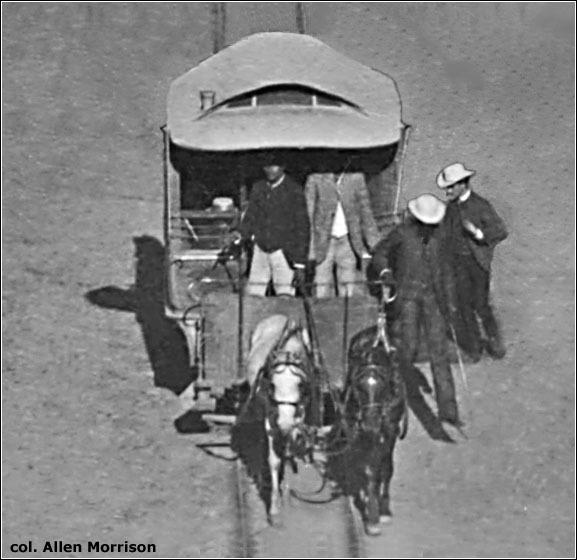 Two steam locomotives and 20 vagones (cars) arrived from England in 1875 and allegedly transported passengers and produce between Montecristi and Copey, 20 km south of the city, until 1885. No one seems to know when the Montecristi tramway closed. The Schoenrich text quoted below notes that the line was still running in 1918 and the U.S. Navy manual quoted above observed its operation in 1922. But the line is not mentioned in W. Rodney Long's Railways of the West Indies, published by the U.S. Bureau of Foreign & Domestic Commerce in 1925 (and whose information represents the period 1923-1924). But no other confirmation or reference to a street railway in Puerto Plata could be found. Dominican Republic. Colección de Leyes, Decretos y Resoluciones Emanadas de los Poderes Legislativo y Ejecutivo de la República Dominicana. Santo Domingo [various years]. Franchises for tramway construction. See Google Books scan of years 1876-1886. Wilhelm von Lindheim. Strassenbahnen: Stastistisches und Finanzielles. Wien, 1888. A chart notes a tramway with 22 cars in Puerto Plata. Casemiro de Moya. Plano de la Ciudad y Contornos de Santo Domingo. 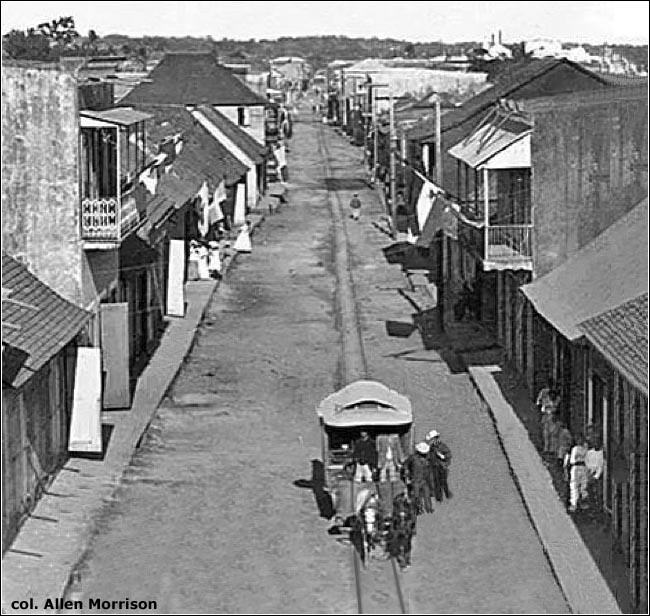 Santo Domingo, 1900. Extraordinary, large scale street map shows entire tram route – with passing sidings! – from Santa Bárbara to San Gerónimo. Otto Schoenrich. Santo Domingo: A Country With A Future. New York, 1918. 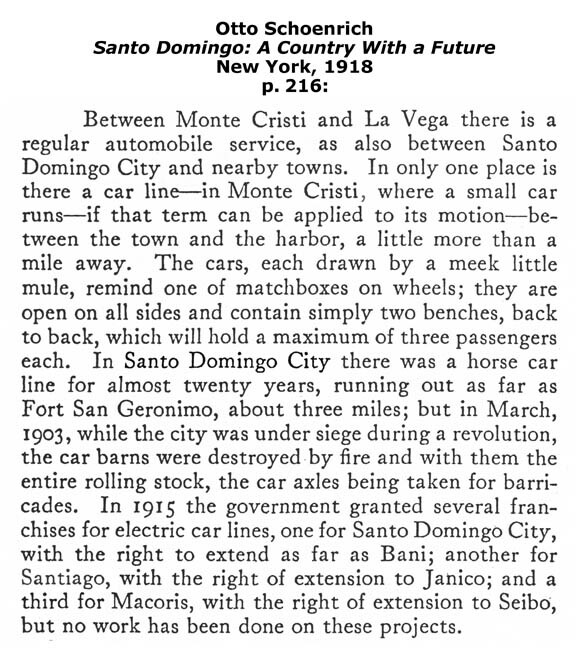 Text on p. 216 describes the Montecristi line (apparently still in operation) and plans for electric tramways in three other cities. U.S. Navy Hydrographic Office. West Indies Pilot. Volume 1, 4th edition, Washington, 1922. Brief but interesting description of the Montecristi tram line, p. 438. Quoted in text above. Elpidio José Ortega. Ensayo turístico y arquitectónico de la ciudad de Montecristi. Santo Domingo, 1987. Best description found of the 1875 locomotives which, according to the author, were later mule-drawn. He uses the word locomotora for both locomotive and tram. Pages 132-133. Michel Baud. 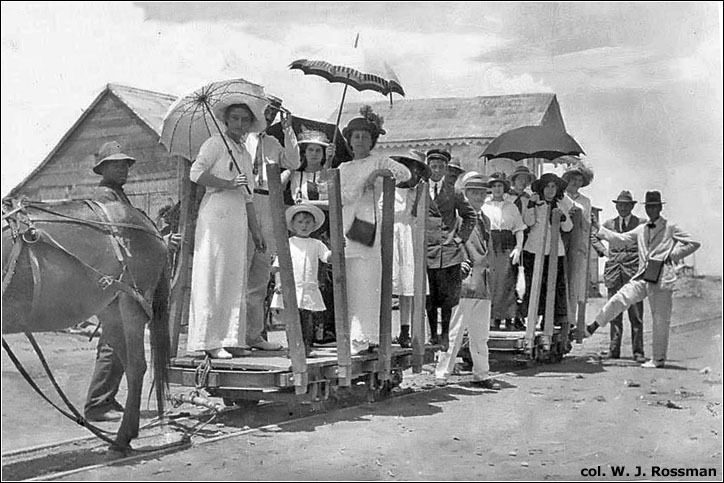 Historia de un sueño: los ferrocarriles públicos en la República Dominicana, 1880-1930.Santo Domingo, 1993. Impressive 145-page study of the two steam railroads on the north coast. No mention of the Santo Domingo tramway (which was a ferrocarril público), or of the railways on sugar plantations. Eugenio Pérez Montás. La Ciudad del Ozama: 500 años de historia urbana. Santo Domingo, 2001. Large, lavishly produced, 554-page volume with color illustrations, maps and text in Spanish, English and French that details the city's urban history. The tramway is never mentioned or shown! Rafael Darío Herrera Rodríguez. Montecristi: entre Campeches y Bananos. 173 pp, Santo Domingo, 2006. On page 46 the author notes the "tranvías" which he says operated on the country's sugar plantations. 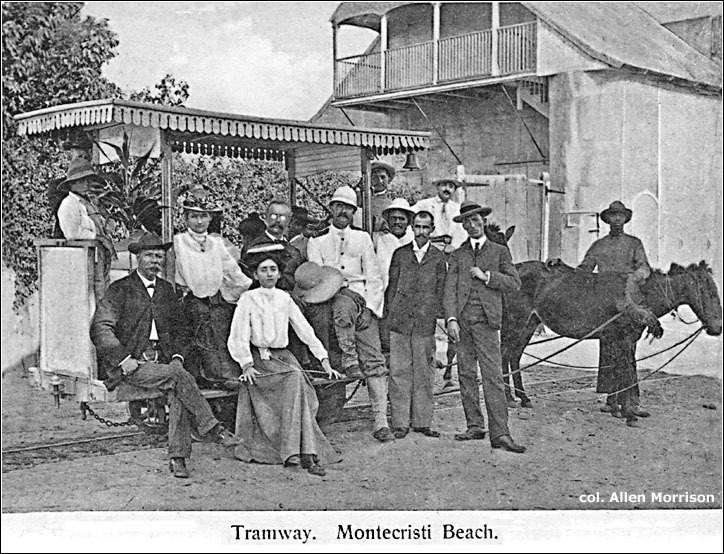 But, incredibly, nowhere his study does he make any mention of the tramway that operated in Montecristi, the focus of his book! Frank Moya Pons (coordinador). Historia de la República Dominicana. 723 pages, Madrid, 2010. Four sentences about the Santo Domingo tramway, p. 289. Nothing about the Montecristi line. Thomas Kautzor. The Dominican Republic chapter of The Internatioinal Steam Pages, 2014. Fine, detailed survey of its public railways, sugar industry railways and other plantation and industrial lines. Wonderful data and photographs of past and present. Allen Morrison! Leo y escribo español.